There once was a time when Sale’aula was a thriving Samoan village, but all of that changed in 1905 when Mount Matavanu rumbled to life and covered the village in lava. While a couple of hardy families have built atop the hardened black rock, much of Sale’aula today is what lies in ruins, partially covered, unseen but not yet forgotten. A popular stop on Savai’i day tours, the Saleaula lava fields are most commonly known for the haunting church that rises up out of the lava—a building that somehow, despite the odds, continues to stand here today. 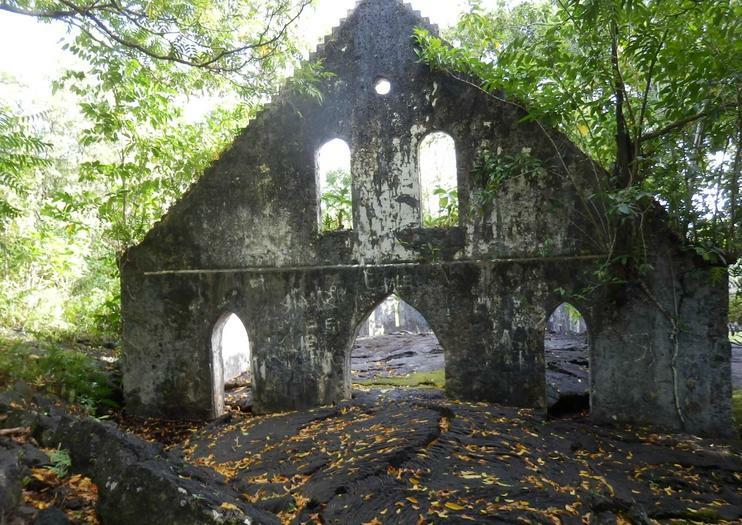 Riddled by tree trunks and twisted old branches, the roofless church is close to the spot that’s known as the “Virgin’s Grave,” which locals believe was spared by the lava because of its sacred past. Try to avoid visiting in the middle of the day since the rocks can be hot and there is minimal shade. Be sure to bring sunscreen and proper footwear, and the Saleaula lava fields are a popular stop when touring the northern coast. Did You Know? Even though the village was swallowed by lava, villagers had months, and in some cases, years, to gather their belongings and leave the area before the lava took over.